Moral, Believing Animals 0 Edition What kind of animals are human beings? And how do our visions of the human shape our theories of social action and institutions? 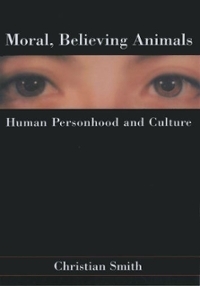 In Moral, Believing Animals, Christian Smith advances a creative theory of human persons and culture that offers innovative, challenging answers to these and other fundamental questions in sociological, cultural, and religious theory.Smith suggests that human beings have a peculiar set of capacities and proclivities that distinguishes them significantly from other animals on this planet. Despite the vast differences in humanity between cultures and across history, no matter how differently people narrate their lives and histories, there remains an underlying structure of human personhood that helps to order human culture, history, and narration. Drawing on important recent insights in moral philosophy, epistemology, and narrative studies, Smith argues that humans are animals who have an inescapable moral and spiritual dimension. They cannot avoid a fundamental moral orientation in life and this, says Smith, has profound consequences for how sociology must study human beings.